Sarah Perez says the Conversation Has Left the Blogosphere. I’m not sure if that’s true. Blogs have comments, but frankly they can be awkward vehicles for having a conversation, particularly if it is back and forth between dueling blogs. I read her article in a bit different way that is more concerning. There are now so many vehicles for conversations that she lists no less than 15 ways to keep up. Are we really having conversations, or are we just forming small cliques around the trendy fashionable applet du jour? Twitter, FriendFeed, Social Bookmarking, Disqus, yada, yada, yada. Get enough vehicles going and there isn’t much conversation. Everyone is scatterd in small groups. Everyone is checking a million feeds or searching for the one right aggregator. And the aggregators don’t help either as they try to create sticky lock-in by not exporting their conversations ala FriendFeed. Conversation is facilitated by common channels, not a zillion incompatible channels. If every country had dozens of incompatible cell phone standards, the value of a cellphone would be seriously diminished. Incompatibility of conversation channels is not just an attention overload problem, it’s much more insidious. – Do Some Heavy Lifting in the CRM and Marketing World: It’ll be very helpful to be able to go from company to people (as opposed to just going people to company before the new feature) to build up this kind of functionality. – Get More Private and Premium White Label Services for Companies: It is hinted that companies will eventually have Wiki-style control over some aspects of their profiles. That could make the profile a good home page for internal white label applications. There’s still a lot of work to be done to enable those services, such as the ability to add fields to the entries for people that are private internal-use only for the companies. Being able to understand the hiring and promotion scene at a company is great, and a logical next step is to support internal recruiting and mobility within an organization as a private white label service. – Web Mentions: There is talk of news feeds that show “headliners” or people’s mentions in the press. That’s a good start, but the web is a lot more than press releases. It should be straightforward to add additional feed sources into the framework that the new initiative creates. – Creating a Business Relationship Semantic Web: I had suggested that LinkedIn could “own” the semantic web for people. Tying people back to companies and vice versa is classic semantic web activity. Without the semantic web, search engines have to guess from keyword proximity and pages whether two are related. LinkedIn has a chance to validate this more fully and be a webwide system of record for who is connected to which companies. Again, it’s a good start. It’ll be interesting to watch the future of LinkedIn unfold. Are Custom Chips An Answer to the Multicore Crisis? Stacey Higginbotham wrote an interesting piece that made me wonder. Apparently there are lots of less than cutting edge chip fabs out there that people want to keep running. It got me to wonder. In an age where smaller features on chips translate only to more transistors, but not neccesarily faster transistors, is the ability to have more transistors as economically valuable? Particularly if we can’t put them to use? The problem is Moore’s Law these days translates to more cores, not faster clock speeds. Nearly all the software out there can’t make use of the extra cores yet, and there is a lot of discussion about how the world may have to completely retool software to make use of lots of cores. Meanwhile, Intel sails on with 6 core chips on the horizon, more to come, and not a very good idea what to do with them. What if what separates the latest “good” fabs from older “obsolete” fabs is not longer that valuable? Maybe the value is less from ever smaller feature sizes and more from new chip types? That would shift the economics from favoring giants like Intel capable of building ever more expensive fabs to those with the IP to design more new chips on fab processes that are “good enough” for lots of interesting applications. As big as Intel is, maybe driving faster CPU’s is not the most lucrative pasttime at this point in the technology curve. It used to be that a general purpose CPU that constantly doubled in speed every 18 months (Moore’s Law) was the place to invest. It was a truly general purpose device capable of running all sorts of software. There have been special purpose chips built too for maximum performance in various areas: graphics coprocessors and various network chips are good examples. Suppose we can make special purpose chips for almost any purpose. I once talked to a startup that had built a hardware search accelerator for example. They vanished into the Government spy world never to be heard from again, but it is intriguing. If you could create a dirt cheap special purpose chip, what would it do? What would be the market for it? Before the dawn of RISC there was much interest in hardware accelerators for specific languages. Lisp machines were one such. I remember reading a quote from Alan Kay that modern machines don’t run dynamic languages like Lisp and Smalltalk as much faster than the old machines like the Dorado as their newfound clockspeeds would imply they should. He hinted that radically different hardware architectures could greatly benefit such languages. I couldn’t find more on that than this quote that says the new generation is only about 50x faster than the old machines, which is a pretty poor showing indeed. Today we have a renaissance in the interpreted and scripting languages that are descendants of languages like Lisp and Smalltalk. Languages like Ruby on Rails, Python, and PHP are very mainstream and might benefit. One wonders whether even Java might benefit. Would a chip optimized to run the virtual machines of one of these languages without regard to compatibility with the old x86 world be able to run them a lot faster? Would a chip that runs Java 10x faster than the fastest available cores from Intel be valuable at a time when Java has stopped getting faster via Moore’s Law? It seems to me it would. As you can see, and as Dave McClure wrote in his 500Hats blog, adding these two together results in total dominance for web mail. True enough, but there is even more going on around this pairing. Microsoft has chosen to make Exchange and Sharepoint the initial centerpieces for its SaaS/Cloud Computing initiative. Yet web mail makes for a painfully exposed flank that could be attacked. Picking up Yahoo effectively eliminates that flank. In fact, they’ll be able to seamlessly plumb all these disparate mail systems together in interesting ways if they think about it for a bit. This will be tantamount to the same kind of market share and dominance Google has over search, but instead it will be e-mail. That’s certainly not as ideal as Search, but it is interesting. After using Xobni for a while, I am one of those who believes e-mail can be revitalized by injecting some social networking features into it. Microsoft, BTW, is rumored to be closing in on a Xobni acquisition as well. In fact, I wrote that one of the 10 things LinkedIn ought to do is to either acquire or build Xobni’s functionality. Picture what it could mean if Microsoft has this much control over e-mail, gets Xobni, and ties it all together with Social Network-like capabilities. And what about the aggregators? Why let someone new like FriendFeed even get a foothold? Let’s take the grungiest, oldest, most out of date aggregator on the planet, and ask what we’d do if we were driving the bus. I’m referring to Microsoft Outlook, of course. It can sort of do RSS feeds already. I would do a total facelift on the thing and kick it up a notch. Make Outlook the be all and end all aggregator. Make it do Twitter, blogs, and every other conceivable thing. And while we’re at it, let’s make it do these things well. Let’s Silverlight enable it. Wouldn’t that be a kick in the head from Microsoft? Isn’t just the thought of it a cautionary tale for how this can wind up? As everyone becomes a service, we lower the friction. As so often happens, and as is so counterintuitive, lowering friction here will reduce diversity of aggregators. There’s just not enough differentiation to sustain a lot of players, so the Microsofts and Googles can win. Maybe this is the value of Yahoo to Microsoft. It can be the destination site for everyone else whom Microsoft can regard merely as a web service. The strategic possibilities for Microsoft are fascinating. The question is whether they see them clearly and whether they can execute on them. What I can tell you is this kind of competitive strategy is exactly what they’ve always been good at. Robert Scoble has an interesting post. He muses about the difficulty one entrepreneur has getting funded versus another. Andrew Mobbs has a dream of using cell phones to replace credit cards. It’s an interesting idea. The trouble he has is a little chicken-and-egg problem. It’s a big idea that requires a fair amount of capital to test. In the old days, there were lots of deals rambling around where “a guy and a slideshow” could get a couple of million dollars to build the product and get the first customers. Yet investors these days expect you to come to them with ideas that are at least partially tested. 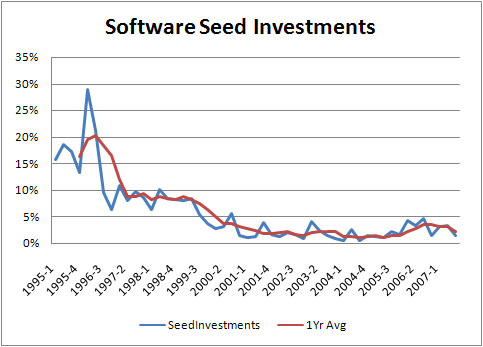 They’ve moved out of the seed business, despite what various rounds may be called. The current paradigm expects you to develop your 1.0 product and get some initial customers signed up for it on angel money. That typically means $500K to $1M at most. Scoble contrasts Mobbs idea with that of Omar Hamoui’s AdMob, which is a mobile advertising network. Apparently it got funded by top-tier firm Sequoia within 24 hours. Why? Because they had a product and customers before they went calling on VC’s. There’s another important factor at work here that Scoble touches on. Reducing access to capital will tend to focus the deal flow around deals that can get done with minimal capital. That’s why we see so many me-too ho-hum Web 2.0 deals. It’s easy to build the software. The Valley and its current bootstrapping strategy has got everyone focused on quick experiments that don’t add a lot of value. It’s fun, but it seems to be largely a fad that isn’t discovering many new killer apps. What happened to asking whether an idea is a feature, a product, or a business? How does Fred Wilson’s new investment baby, Disqus, add lasting value? It’s an add-on to blog comments. In other words, a feature, not an application or a business. Why can’t the top 2 or 3 blogging platforms add the Disqus functionality and commoditize it out of a future? It’s not even that there’s just one of these. We also have IntenseDebate, TechStars, SezWho, and CoComment. Wow, now there are 5 companies focused on this feature for blogs? Mathew Ingram reports that Fred Wilson says that he seesthe company as doing for comments what RSS did for blog posts and other information, and that Disqus could be the one that “unlocks comments from blogs and brings them into the mainstream” and also “surfaces the most interesting blog comments and blog commenters.” Let’s suppose they’re successful, which is a big if, because I’m not sure comments are as valuable as RSS. RSS boiled down to one company, as David Winer has lamented, and that was Feedburner. There’s a whole passle of similar deals out there. I just signed up for the latest wunderkind, FriendFeed, becauseScoble said he’d converted and saw it as a TechMeme and Google Reader killer. Scoble got bored with TechMeme because of the sameness and big media presence (yeah, I warned you this would be the case) and he was fed up with the performance of Google Reader. “Does FriendFeed solve a problem or highlight it?” asks Josh Catone. Well, it puts things in one place, sort of. I haven’t found a way to import the OPML from Google Reader yet so I don’t know how Scoble imported his 800-1000 feeds. Perhaps he’s just quit reading them and gone totally aTwitter. But, now that you have all that stuff there, it seems like you’re tee’d up to be a total Attention Overload victim. I can’t see much in the way of tools to help you manage that. It’s just another simple minded piece of software that’s cute and was quick and cheap to build with modern web technology, but does it really help anybody? Is it profound. No. Maybe it’s time for VC’s to move on from Web 2.0, at least if this is as fresh as it’s going to get. Marshall Kilpatrick points out that the long tail is absent from MySpace just as on Facebook. I’m not sure it’s really absent, but it is pretty slim pickings. More importantly, maybe its time to actually consider looking into funding something significant. VC’s are not unlike any other portfolio manager. If their portfolios are too highly correlated, risk increases. If they’re correlated with their whole market, their returns regress to the mean. Who is going to do something different to change this boring status quo? 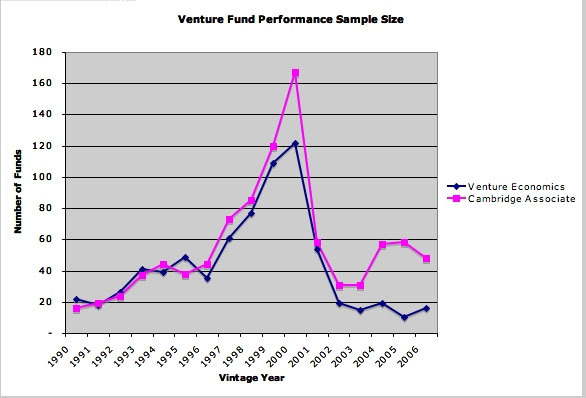 What Would Warren Buffet Say About VC Investing Today? We’re missing out on a lot of good ideas simply because the initial capital required is too great for today’s model. Time to move on, these are not the droids you’re looking for. The riskiest part of the spectrum has to date proved the most rewarding, and the greatest capital gains have been earned in companies which were started from scratch. Let’s say you buy a company for 100mm. And then you sell it three years later for 200mm. That’s 2x but a 100mm gain. The partners in the firm get 20pcnt of 100mm or 20mm. This math doesn’t work for me. First, what VC has 20% of the company? More like 80% of the company owned for $50M by the time all rounds are counted. The company will likely go for more than $250M too if it IPO’s. And we’ve left aside all talk of the liquidation preferences that are always present in these deals. Though the 10x is probably representative. My math would be more like 70-80% ownership for $50M over 5 years. That gets the VC’s 80% * 250M = $200M, or a $40M carried interest. Note that this is not an especially happy outcome for $50M invested–a 4:1 return. The happy outcome is an IPO at $500M or more. Now we’re looking at 80% * 500M = 400M on 50M, an 8:1, and the partner’s carry is $80M for 5 years work vs $20M for 3 years work. The real issue is there aren’t going to be so many $100M late stage deals to join if there isn’t enough seed money to fund getting there. While we’re on the subject of obsolete paper artifacts like resumes, Zoli Erdo brings up the topic of NDA’s. Specifically, that VC’s won’t sign them. Most big companies won’t either, or if they do, they want you to sign their paper, which may say something completely different than you’d expect. The last time I signed an IBM NDA, for example, (it’s been many years!) it said they owned whatever it was you were about to show them automatically. What about the shoe on the other foot. You go to interview for a job with a startup, and they want you to sign an NDA. Do you sign it? You’re going to have to sign an NDA and Intellectual Property Agreement if you take the job, but personally, I have a hard time signing an NDA as part of a job interview. I usually will just ask them to stick to talking about things they’re comfortable with outside an NDA. And, I’ll remind them I’m a person of integrity who won’t reveal their secrets. If they’re overly uncomfortable with that, maybe we shouldn’t be talking. Let’s face it, the biggest reason for an NDA is to protect the patentability of ideas. That’s a real reason to want an NDA. A clock starts running when you show an idea outside an NDA that limits you ability to get a patent on it. But, the clock is a year long. If you aren’t going to get that patent filed within a year, aren’t you kidding yourself? Especially if you are a startup? There’s one other piece of paper I file as obsolete. That’s the non-compete. Again, companies will require one if you join, and you’ll need to sign it, but I’ve had them presented for lots of other types of much more casual relationships. For example, I was being asked to a very short-term consulting gig by a VC one time and as part of the agreement they wanted me to agree that I would not attempt to hire anyone from any of their portfolio companies. I had to pass on that one. It didn’t make sense to me. Interesting flurry of blog posts about how blogs make better resumes than resumes. If you think so, you should certainly consider this blog as my resume. People ask me what I’m up to a lot. The answer is, I’m looking for my next gig, and meanwhile, I’m learning new things and networking a lot. The SmoothSpan Blog gives me a chance to share back some of what I learn along the way. I’m lucky enough to have a large enough network that it has reached critical mass and continues to grow without too much effort. The blog helps that networking process too. If you’re interested in cloud computing, whether SaaS, Web 2.0, or Enterprise 2.0, and you want to get a cup of coffee to compare notes, drop me a line and let’s get in touch. I may or may not want to get a cup of coffee, but I’ve met a lot of great people that way. Meanwhile, I’m not sure if the resume is dead or not. A lot of good people don’t have blogs and may not enjoy writing as much as I do. For certain professions, such as markets or product managers, its hard for me to imagine why you wouldn’t have a blog, but for engineers it is more rare and less highly correlated with essential skills. I would say that you can learn a lot about a person reading their blog, so I’m always excited to find someone I have just met has one. For those of you not yet ready to throw the resume in the trash, mine is available and current as well, but I suspect this blog will be more illuminating. The only cure for groupthink is diversity. Social news sites like digg and reddit are diversity-elimination machines so this boat has already sailed. I’ve been saying this for a long time. If you’re seeking out what the likes of Digg, Reddit, and Techmeme have identified as the “hot” items, you’re just making yourself more average. You’re opting into group think, and I don’t mean the wisdom of crowds. One of the key requirements for crowds to be wise is that they be independent. A whole bunch of people on a service like reddit or Techmeme are just oscillating around the same meme feedback. Very little new is being created there. Isn’t that why you get a bunch of hits from one of those services but little lasting bump up in your ongoing traffic? It’s just the lemmings looking for their next meme cliff to step off of. If you want to get smarter on the web, look for new things that aren’t in those places. Spend a few hours on Google deeply researching a topic you’re interested in. Find some new sources for information. Add some new feeds to your RSS reader. You won’t be disappointed. I love it. Microsoft is adopting Flash Lite for its mobile phone work after Steve Jobs said it wasn’t good enough for the iPhone. As Techcrunch points out, Flash is ubiquitous on the web. Apple should adopt it, iPhone users (including me) desperately want it, but Jobs is Jobs. OTOH, Adobe won’t wait forever. They know Microsoft will eventually replace Flash Lite with Silverlight. Maybe they should do their own mobile phone software? Which brings me to another question I ponder from time to time while commuting. Why doesn’t somebody clone the iPhone? Not just a little bit, but perfectly. Now is the time. There is no ecosystem to speak of despite the new SDK and big fat VC funds for iPhone deals. Jobs saw to that by waiting so long to introduce said SDK. It’s odd, but given how Apple has gone to market with this phone by locking a lot of folks out, it seems like there’s an opportunity to clone it and sell some phones. Usually one has to look for the Next Big Advantage and not just clone, but I think here a clone would be fine. What better company to build one than Adobe partnered with Nokia or one of the other handset makers? “The Future is Web Services, Not Web Sites,” says Steve Rubel. Rubel’s point is that every site can’t be a destination. Aggregation will happen because the Attention Crash will force it ot happen. The way to survival is therefore not creating sites, but creating web services so that whichever destination your “eyeballs”, excuse me “customers”, move to, they can still get your content via an API. 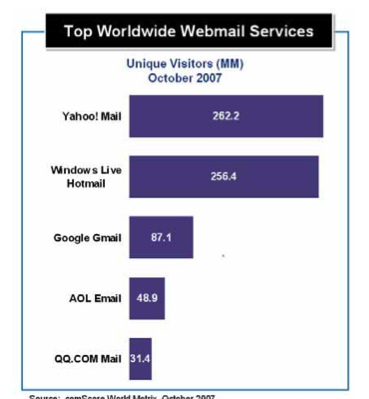 Fred Wilson says, “You cannot be a destination exclusively on the Internet anymore. If you are not a open web service, you won’t get nearly as far these days.” He’s goes on to cite Twitter and its api as proof that the strategy works because now Twitter is everywhere. Google and Facebook are vying to see who can set the standard for how these api’s should work. MySpace is just rolling out their Open Social support. YouTube is suddenly offering to be something of a white label video service. These days, you can’t just be a web site, and you’re likely not successful enough to be a platform, so you neeed to make sure you can be a service on someone else’s platform or destination web site. Yahoo has opened up search, want to be a service on their platform/destination? Heck, Will Fastie just quit his job as powerful Hummer Winblad VC to go be CEO of a widget company: clearly he believes and voted with his feet. Widgets are neither fish nor foul in my mind. They’re sort of like being a destination because you moved in and squatted on someone else’s destination. Oops, there goes the neighborhood! Amazon gets it and has rolled out Facebook widgets so your friends can buy you the books you want without ever leaving Facebook. Is this really what the future holds? Is it healthy, sustainable, vibrant, and most importantly for the continued deal flow, is it lucrative? Michael Arrington brings us a bit of counterpoint. He wonders why people will want to access things they mostly can and should access elsewhere in FriendFeed? Why go to FriendFeed to Twitter instead of Twitter itself? The vast majority of what’s being read in FriendFeed is Twitter, Blogs, and Google Reader (more blogs?). I agree with Arrington. I don’t think folks have thought through very well what this all means strategically and financially. There is a great deal of risk lurking out there. This is one of those times when there is a race of gripping one hand above the other on the baseball bat and eventually there will be no room left to grip. Conventional wisdom likes to ask whether a new startup idea is a feature, a product, or a business. If players are not real careful, becoming a web service is making the strategic decision to become a feature on someone else’s product. How the heck do you monetize these web services in a world like that? You’ve ceded the value of being the destination. You have customers, but only by virtue of your destination partners. What are you really? You’re the OEM software that gets bundled with the PC. Anyone who has ever been involved in one of those deals knows it’s a sorry business. There’s no money in it. You become the flavor du jour: here on today’s PC, replaced by something fresher on tomorrow’s PC. You are absolutely not in control of your destiny and you wander the world hat in hand. Rubel is right. Every site can’t be a destination. It is probably better to take sloppy seconds than not to exist at all. But have no illusions about building a huge business around this stuff. I think it will be very hard. Will Fastie may in fact be in a good place. He, at least, is selling blue jeans and pans to the gold miners rather than heading out on the Yukon trail himself. Trust a wily VC to see the silver lining in the dark cloud!